Eating breakfast or lunch at office has never been so simple and stylish. These versatile storage containers for food are the perfect way to have healthy meals wherever we go. Ideal for adults and children alike, they are the most fashionable kitchen tools we’ve seen, very chic and fun. The award-winning British company Black+Blum came up with these ingenious products cleverly designed to solve the issues of everyday life in the home and office. The whole concept is about making your food look good and make it a pleasure to eat from and we think they achieved this and even more. This family of storage containers for food deserve our attention because they are just fabulous: simplistic, highly functional, practical, with a modern, original and stylish design and even eco-friendly . They are the best thing to happen to left overs since the ziploc bag!! What else can you ask more? Who wants to buy anymore pre-packaged lunches instead of creating a healthier own one when we have such super-handy gadgets which work great for noodles, soups, stews, oatmeal, fruit salads, rice dishes, and so much more? They are sold through selected stores around the world and their innovative designs have already won many awards. Packaging with these storage boxes from Black+Blum you’ll make your life easier and you’ll enjoy healthy meals in a stylish way without worry about mixing up different dishes. 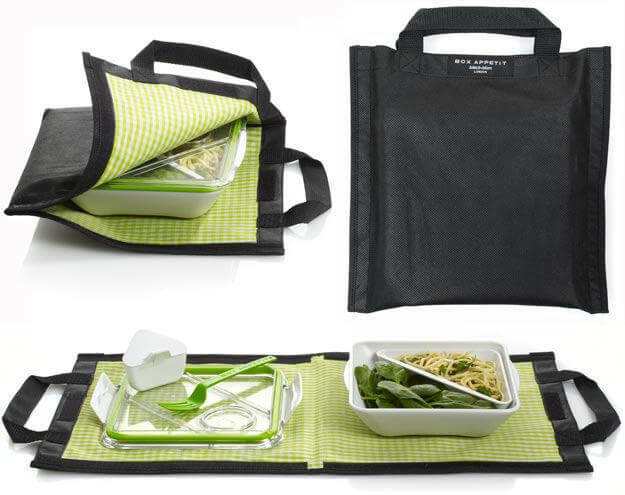 Easy to carry in the Box Appetit Bag, they are more like ceramic bowls than standard food boxes. Their design is improved so that now you can pack more than one dish due to interlocking and removable food compartments and separators inside the box which they have. Each one of them feature „glass- like” lid with a clip specially made to hold a durable fork with a deep curve for scooping and an angled edge for cutting or a spork, and also a watertight locking seal which allows you to pack soup, yogurt, or oatmeal. Made from polypropylene and copolyester (BPA free), the Lunch Pot, Bento Box and Box Appetit are microwavable and dishwasher safe. For more information about these great accessories, visit Black+Blum website.